If you’ve found your way to this article, you’re clearly a grilling aficionado. Perhaps you’re interested in all manner of grilling and smoking, and your dream backyard is loaded up with the best gear? But if the reality is your outdoor space is lacking in capacity, you need as versatile a grill as you can find. Rather than leaf through page after page of stats and “unrehearsed” testimonials, you’ve cleverly found your way to us. We’ve done the research for you, and now all you have to do is read our findings. You’ll be one big step closer to making a very important decision. You’re about to find out about an exciting piece of equipment that, at first glance, seems to have a lot of potential. Our REC TEC RT-700 (BULL) Pellet Grill review will shed some light on a kind of product you might not know much about. Are there wood pellets in your future? You’re about to find out. 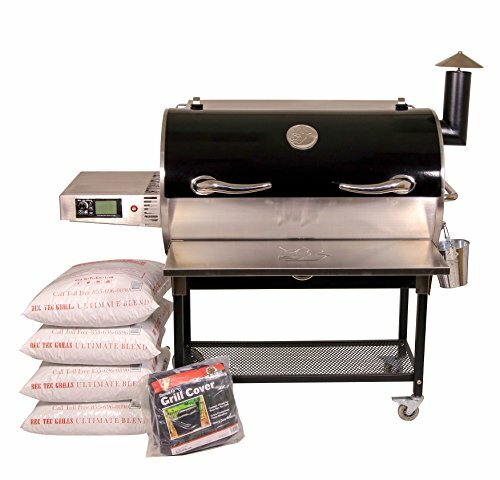 What is the REC TEC BULL RT-700 Wood Pellet Grill? Why Do People Choose REC TEC Products? Should You Buy the REC TEC BULL RT-700 Wood Pellet Grill? Quite simply, it’s a very large smoker and grill made to prepare large quantities of meat at once. The RT-700 burns wood pellets, which are compressed nuggets of sawdust resembling rabbit chow, to provide smoke and flavor to the meat, usually at low temperature over a prolonged period. The selling point of the RT-700, apart from the whopper hopper, is the automatic pellet feeder and temperature control. Just set your temperature, and the feeder supplies wood pellets to the firebox at just the right pace to hit and hold whatever temp you’ve chosen to set it to. While it can’t quite achieve searing temperatures, it can grill meat without trouble at 500f, as well as smoke and cook low ‘n’ slow. We love it, and it features highly in our recommended best pellet grills roundup for 2018. REC TEC came into being only a few years back and is the creation of two guys looking to automate the temperature control process on a smoker to make smoking more accessible. Inside you’ll find the enormous barbecue, stainless steel cooking rack, plus a drip pan, deflector plate, grease bucket, tool hooks, towel ring, and the legs, wheels, side shelf, probes and shelf that support the cooker. You also get a pair of stainless steel horns. These are the lid handles so don’t bolt them to the front of your car, or your motorcycle helmet, no matter how tempting it may be. The first impression you get is that this sucker is huge! This is, of course, absolutely the correct impression. Everything about it says large and sturdy. Confidence is high! It’s pretty well packed, but there’s a fair bit of assembly involved. Not surprising, given the size. Appearance-wise, you have to love the beautiful stainless steel features. It’s clean, professional looking. The horn handles and “nose ring” towel rack are fun touches, though I can imagine them turning some people off. It’s great to see the probe access port on the side of the cooking chamber – much better than shutting the lid on your thermometer cords. All in all, it seems to be a solidly built and well thought out grill. Evidently, they’ve made great strides since the first generation. Well, they’re not choosing them for the name because they aren’t well known – it’s more of a cult following so far, though I can see that changing in the future as the word gets out and perhaps more products come to market. What stands out about REC TEC is the thought they’ve clearly put into their grills, and that they listen to what their buyers want to see and upgrade accordingly when new models are designed. The fact that they make good grills and they make them in America likely also holds a lot of appeal for many would-be owners. For really, really long smoke times, you can fill this hopper with up to 40 lbs. of pellets. I can’t imagine there’s any way you’ll run out in mid-smoke, no matter how long you’re at it. It’s divided, too, so you could mix “flavors” if you like. The real genius of this grill lies in the automation. Pellets are transferred from the hopper to the firebox at the correct rate to maintain whatever temperature you’ve set on the electronic thermostat. Set it and forget it! As mentioned above, hitting the right temperature is a piece of cake with the RT-700. Forget about adjusting vents; use the up and down arrows on the thermostat until you’ve got it where you want it, and let the electronic magic happen. You’ll always know at a glance if you’ve got the temperature right. The display is easy to read and there’s no guessing like there is on a typical thermometer that only marks off every 50 degrees, or so. The up and down arrows make setting the right temperature as easy as using a stove or microwave. The ramp-like drip tray cleverly guides the excess grease out a chute and into a cute little stainless steel bucket clipped to the exterior of the grill. Nice and easy for clean up, and protects you patio or deck from stains. It’s like the designers put on everything they wished their previous grills had – and that’s probably close to the truth! The towel ring, though obviously a bull’s nose ring, is actually handy, as are the four tool hooks, the probe access port, and the chimney cap for keeping out the rain and snow. The rollerblade-style wheels look like they’ll roll with ease, and I like the big shelf underneath for storage. Very, very well designed for user convenience. The devil is in the details, or so they say. Let’s go beyond the spec sheet and have a look at some of the key intangibles that have to be considered before making a decision. The hardest part about using the REC TEC RT-700 might be lifting up the bag of pellets to dump them in the hopper. PRO TIP: Use a scoop if you can’t handle the heft of the full bag. Other than that, it’s pretty straightforward. If you can use a modern oven, you can operate this grill with ease. The drip tray should minimize the amount of cleaning you need to do on the interior, but it’ll still need a wipe down now and then. The manufacturer recommends very minimal maintenance, aside from cleaning spills off the exterior with mild soap and water to protect the surface. As for the grates – chuck them in the dishwasher. REC TEC maintains social feeds on Facebook, Twitter, YouTube, Google +, and they have a blog and a newsletter. For support, there’s a decent FAQ, a local phone number, a toll-free number, and an online form. They pride themselves on exceptional customer service, and the reviews seem to back that up. Even a number of reviewers who gave poor reviews for the grill (rare, but they exist), still commented on how dedicated the customer service team were to fixing the problem. That’s pretty darn impressive. Use quality pellets! Any from our roundup of the best wood pellets for smoking are a great choice. 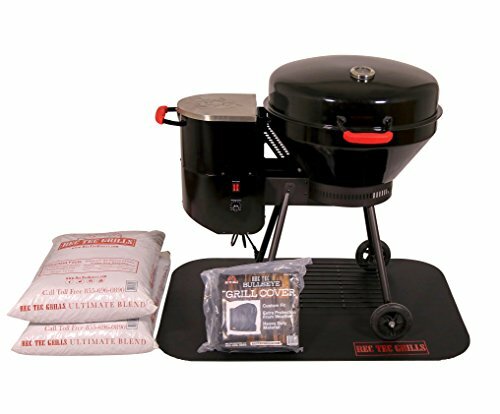 If you aspire to massive smoking sessions and want to grill for the whole neighborhood, this is an excellent choice, especially if you want all that without fussing with charcoal and airflow vents and dampers and so on. Some people thrive on that – others, not so much. Assuming the aesthetics don’t put you off – and personally I think it looks great! – this is an excellent choice for a pellet grill. Epic cookouts will be yours with this monster lurking in your yard. Automatic pellet grilling and smoking on a smaller scale is here! This nifty cooker has all that, but it looks like a kettle grill and it’s only 36”H x 38”W x 28”D at its extreme points. With a temperature range of 200-550F, you can do all kinds of different cooking styles. It’s only 55 lbs., so you can easily move it around and wheel it in and out of storage. Definitely worth a look if you like what you read about the RT-700, but can’t fit it in either your yard, or your budget. Click here to see further details on Amazon. 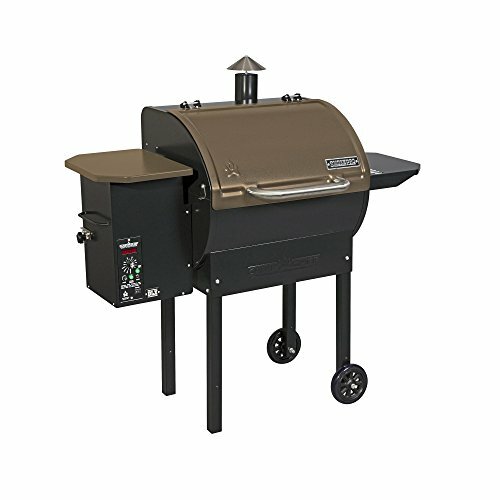 If you think buying the RT-700 might be biting off more than you can chew, but you don’t want to scale back too far, consider this large, but manageable pellet smoker and grill. It shares a lot in common with our subject smoker, but in a more compact package. For a full review, have a look at our comprehensive write-up here. To take a quick glance, you can see pics and specs on Amazon here. Prefer to stick with your charcoal? Then this versatile grill might be what you’re after. While it does not have the automation of the RT-700, it can hit higher temperatures, thus allowing you to sear and smoke on the same cooker. 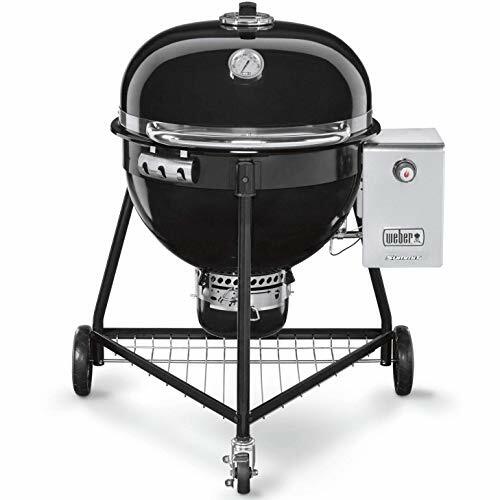 To do some quick comparison shopping, here’s the link to see details on the Weber on Amazon. Well, do you have visions of this epic smoker gracing your backyard? It certainly does make a statement, and if you want to avoid nosy neighbors, you’ll need to either build a higher fence, or just get it over with and invite them over. You can peek over the digital fence and examine the RT-700 to your heart’s content by clicking here to view it on Amazon. That wraps up our REC TEC BULL RT-700 Wood Pellet Grill review. Is this magnificent grill soon to be yours? We don’t blame you if you’ve decided to go for it – it really is a fabulous piece of outdoor living equipment. We’re sure it will bring you many, many years of good food and good times! If you’ve got any Q’s, we’ve got plenty of A’s for you – please let us know what’s on your mind and we’ll address it as best we can. We’re always happy to hear from the grilling community. Until next we meat, live your life large! Hi Gary. We’ve a few recommendations in our pellet grill roundup. Hope this helps.